“Light and delicate from the start” declares the label and it is indeed. 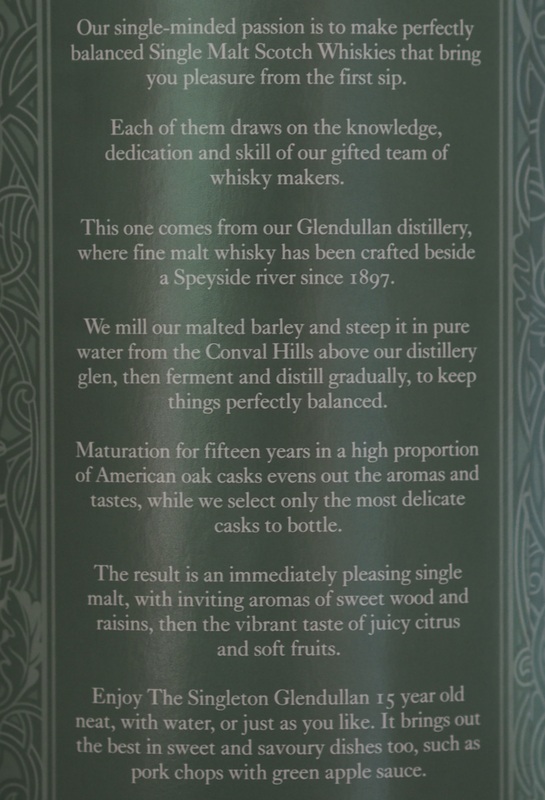 I found some of the claims on their website to be contradictory to my experience (on the ‘rich’ side and “Citrus fresh and super dry.”) The Glendullan certainly is no Island brawler…even the relatively refined Highland Park 12 comes across as a touch brutish after tasting the Glendullan 15. The carton (pic at left) clearly relates a typical modern distillery operation: they mill, distill and age on site. Barley would be from one of the big maltings. Interestingly, only a portion of the casks are American—European oak being used for a chunk of the aging. I agree the whisky would pair well with pork chops and apple sauce. We had this bottle at the beach and it proved to be a good match for evening refreshment as the breeze cooled the house (and us) from the day’s exertions. We enjoyed it with a very dark (85%) chocolate, and I can say it is not often your drink is sweeter than your dessert, but that was the case here. It worked. Nose: Honeysuckle and orange forward, notes of green grass, green apple and freshly risen bread dough. A touch of mineral. Palate: Smooth and creamy; sweet: a bit cotton candy with just a little toffee backing. The honeysuckle blooms with a bit more complexity into a slightly sturdier malt, but retains a floral essence. Finish: As gentle as the whisky is smooth. The herbal and spicy notes from the nose are barely there. Understated oak balances the sweet palate. Vanilla creeps out at the end. 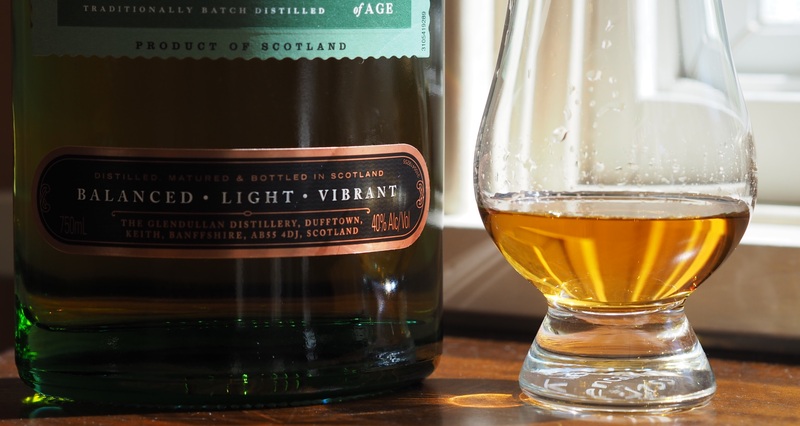 Bottom line: This is the perfect whisky for someone who has delicate sensibilities, a sweet tooth and quite possibly a fondness for doilies. This is the Jane Austin novel of whiskies, old fashioned and genteel, with a bit of wit and character delivered with restraint. Think of this as a comfort whisky. 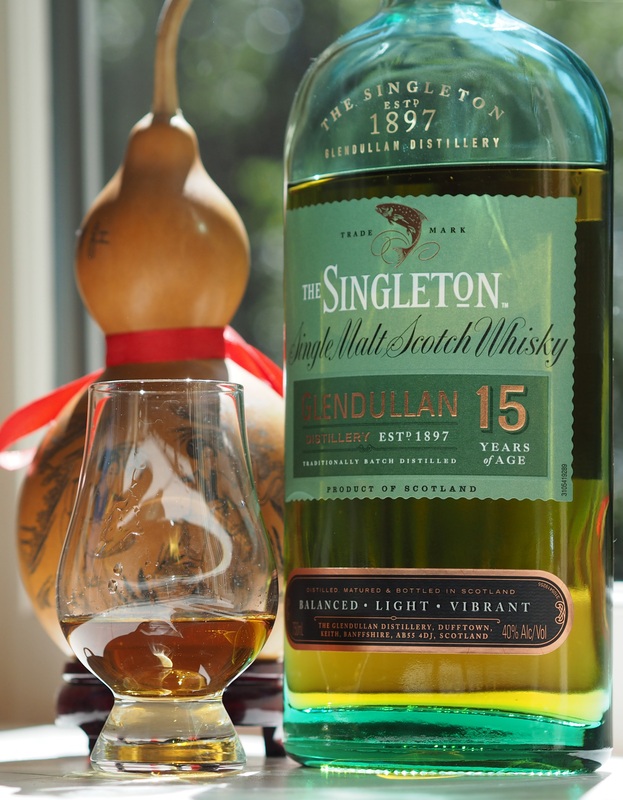 This entry was posted in Scotch-single malt, Whisky and tagged Glendullan, Scotch whisky, Singleton. Bookmark the permalink.